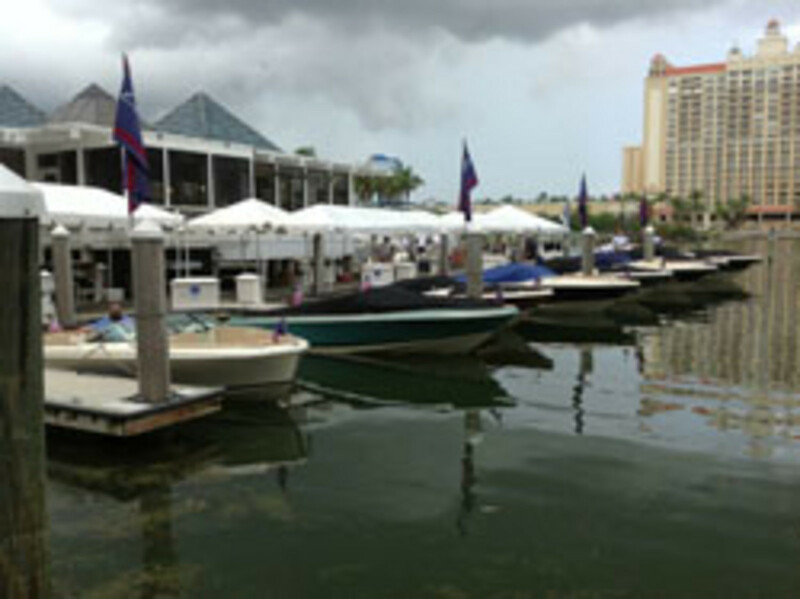 Dealers, consumers and the media got a chance to see the new 21 Capri from Chris-Craft, as well as a hardtop version of the 36 Corsair, at the builder’s annual Chris-Craft Customer Event and Dealer Meeting in Sarasota, Fla. The dealer meeting began Sunday and wraps up Tuesday. “We’ll have about 100 dealers from around the world,” Heese said. Click play for a look at the event. I was able to take the Carina 21 for a spin on Sarasota Bay. It’s a speedy runabout with an open bow that was powered with a single 270-hp Volvo Penta sterndrive with a single prop. The boat accelerates quickly, planing in three seconds. It tracked well in high-speed turns and it’s plenty fast — 54 mph at full blast. Chris-Craft introduced the boat at the Miami International Boat Show. The 21 Capri, which uses the same hull and engine package, has a closed bow covered with a teak foredeck and a huge aft sunpad rimmed with a teak rail. The driver sits in a bucket seat that rotates 180 degrees to face aft; a small snacking table recessed in the starboard gunwale folds out for both the driver and passenger in the starboard corner of the aft seating. 36 Corsair HT (hardtop); 32 Corsair; 32 Launch; 28 Corsair; 28 Launch; 25 Corsair; 25 Launch; 22 Corsair; 22 Launch; 21 Carina; 21 Capri; 29 Catalina; 26 Catalina; and 23 Catalina. The Catlinas, which are high-end center consoles, were powered with outboards ranging from 200 to 300 hp. The remaining boats were powered with gas sterndrives. The 36 Corsair HT was powered with Volvo Penta’s new V8-430 gas sterndrives in a twin application.